Can I Edit the Master Branch? Get the Git URL for the repo you want to move. Create a "bare" repo in Atlas 2 to receive your project. Get the URL for your new repo from the Settings tab. Add a remote from your old repo to your new one and push. Where is Atlas content hosted? Is Atlas content backed up? How is access control handled? Can I export files directly from Atlas into another CMS? Can I set up automated notifications to alert collaborators? What kind of reporting is available? I'd like O'Reilly to create a custom template for my projects. What do I need to know? Why are some "Insert" options unavailable? Do images need to be sized before ingestion? How can I upload multiple images at once? Can I lock files or projects for use by a specific collaborator? How do I number elements like tables, figures, etc.? How does Atlas handle metadata? Does Atlas support interactive elements? Why can't I edit the files in my project? Are there any built-in validation mechanisms? Is pagination info included in EPUB files? How is EPUB navigation generated? What happens when ebook specifications are updated? Can I embed my preferred fonts in EPUB and Mobi files? Do I own my content? Where can I sell and distribute my content? Atlas gives you a blank slate when you sign in for the first time, so your first step will probably be to create a new project. A "project" is any collection of files that will be combined into a single output. For example, a book might be one project, a presentation might be another, or even a theme could be a project. Atlas makes it very easy to create new projects in your account. On the Projects listing page, simply click "New Project" to get the ball rolling. You'll get taken to a page where you can define the title and description for your project, and choose a project template to pre-populate your new repository with some skeleton files based on the kind of project you're making. Learn more about project templates below. Click "Create! ", and Atlas will add a new repository to your Atlas account, pre-populated with skeleton files based on the project template you chose. To help you get a head start, we've created a few different project templates that you can choose from when creating a new project. These templates contain a handful of skeleton files and/or folders based on the kind of project you're creating. For example, the "Book" template includes skeleton files for a titlepage, copyright page, preface, chapter, and appendix. The "Basic" template gives you just one chapter file and the required atlas.json file. If you want an absolutely naked, empty repository to start with, choose the "Bare" template. The skeleton files that come with the "Book" template are samples intended to help you get started writing and to serve as an exemplar of some common markup. However, Atlas doesn't require any specific organization or file-naming conventions. You can place all of your content in one file, break it into as many files as you want, or utilize whatever directory structure you prefer. You can also create a new Atlas project by importing an existing project from GitHub or by taking advantage of Atlas's conversion services. If you have an existing project in GitHub that you want to import into Atlas, you can use the "Import from GitHub" tool. Click this button, authorize Atlas to access your GitHub account, and then you'll see a list of your existing GitHub projects. Figure 4-2. Before you can import a project from GitHub, you need to allow Atlas to access your GitHub account. 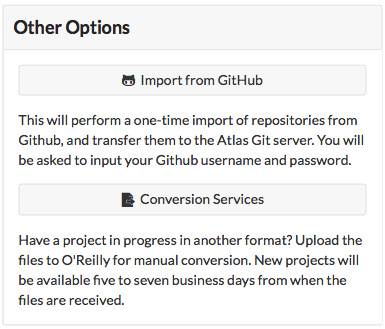 Click the "Import" button to the right of the project you want to add to Atlas. Atlas will let you know if it was able to successfully import your files, and will give you a link to get started writing and building. Figure 4-3. Once a project is successfully imported, click the link to start editing. If your agreement includes use of these services, the Conversion Services button allows you to upload external source files for conversion to a new Atlas project. Upload Word, InDesign, PDF, or ePub files, and you'll be notified when your converted project is ready--five to seven business days. Once you have some projects in Atlas, you'll see all your existing projects listed on the Projects page every time you sign in. Select a project from the list and you'll be taken to the project dashboard, where you'll see a list of all files in the project, and have access to the build tools. When you import a project from GitHub into Atlas, you are essentially creating a copy of the files, that you will be maintaining separately from the files in GitHub. If you want to keep both sets of files up to date with the same changes, you'll need to add your repositories as a remote on a local checkout. You can learn about remotes here. © 2013, O'Reilly Media, Inc.